One of the most well-known islands for a relaxing day trip is Jost Van Dyke, home of the Soggy Dollar Bar, Foxy’s Taboo, and the Bubbly Pool. The smallest of the four main islands in the BVI, Jost Van Dyke measures at only three miles long by four miles wide and has a population of about 300. Don’t let the size of the island fool you, Jost Van Dyke’s Caribbean culture and rugged atmosphere does its namesake Jost Van Dyke, a former pirate, justice. Fun Fact: Kenny Chesney’s “No Shoes, No Shirt, No Problem” was filmed on Jost Van Dyke in 2002, with shots of One Love Bar and Ivan’s Stress-Free Bar (two other great top party spots). 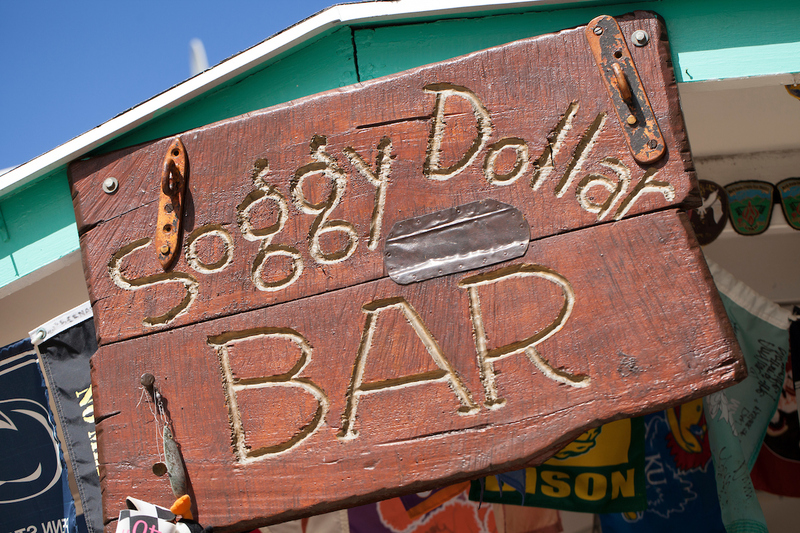 Some locals might argue that if you haven’t made the trip to White Bay beach to the Soggy Dollar Bar, then you haven’t really experienced the Virgin Islands to the fullest extent. The home of the famous beach bar cocktail, the Painkiller, Soggy Dollar Bar gets its name from the wet dollar bills spent by patrons forced to swim ashore from their vessel because there is no dock. But don’t go overboard on the Painkillers before you get a chance to visit the next stop on this day trip, Foxy’s Taboo. Foxy’s Taboo is visited daily by locals with big personalities, including the owner Foxy himself. 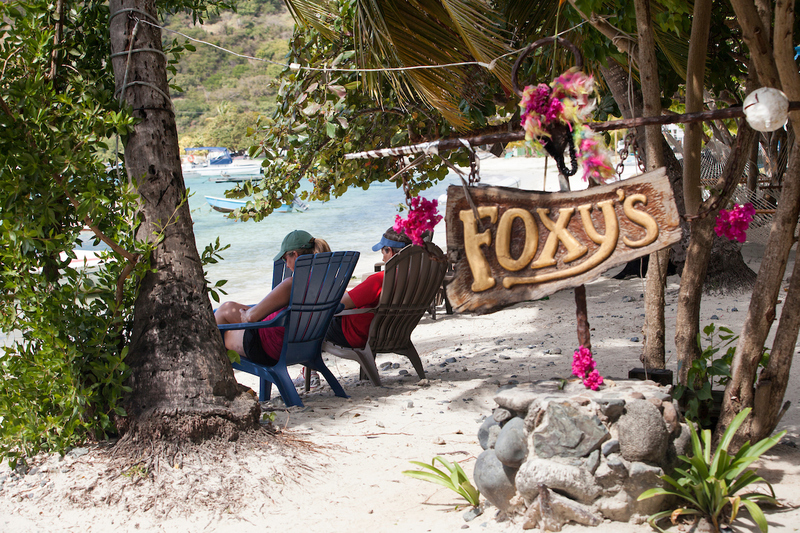 If you are lucky enough to visit this Jost Van Dyke landmark on a day when Foxy is behind the bar, you might be surprised with a personalized impromptu song about your journey to the Virgin Islands. On multiple occasions, Foxy’s Taboo has been voted one of the top places to celebrate New Year’s, Eve! Our adventure continues from here, just a short walk from Foxy’s you will find our next stop. If you are looking for more of a non-alcoholic activity, just a short distance from Foxy’s Taboo in Long Bay you will find the famous Bubbly Pool. The Bubbly Pool is a rock formation that creates a small cove of chest deep water. When large waves break against the entrance of the cove a rush of swirling white foam and bubbles enters the pool creating jet-like water pressure. Plan your trip at the perfect time and the rushing sea water will act as a sort of natural jacuzzi! A trip to the Bubbly Pool is a great alternative to a scuba or snorkeling adventure when the conditions aren’t ideal because the bigger the waves at the Bubbly Pool, the greater the jets! On your walk to the Bubbly Pool, be on the lookout for vegetation covered sugar mill ruins! To get to the Bubbly Pool: Start at Foxy’s Taboo and follow the water until you reach the mangroves, this is where the trail to the Bubbly Pool begins. The trail will lead you through the mangroves up to a small rock face. You should be able to hear the waves crashing from here! If this isn’t enough to convince you, that’s ok! Check out the live Soggy Dollar webcam and let Jost Van Dyke speak for itself. If your goal is just to get from point “A” to point “B”, then a ferry boat ride might be the best option for your group. Bestofbvi.com offers ferry schedules all in one place for ten different ferry operators. Most of the ferries offer a bar or restaurant onboard, but anything purchased on your ride will be in addition to the cost of your ticket. Don’t forget to book your return trip! Ferry operators are reliable, but schedules can change at the last minute – make sure you call your ferry operator a couple of days before your trip to verify the schedule hasn’t changed. A ferry can seem more cost effective, but keep in mind any food or drinks on the ferry will be purchased as an additional cost to your ticket. There are typically more times available to hop on a ferry to or from your destination. If you prefer to have a more flexible schedule a ferry might be a good option for you. Booking a day trip or excursion through a local watersports company will help take the hassle and stress out of planning your trip to Jost Van Dyke. 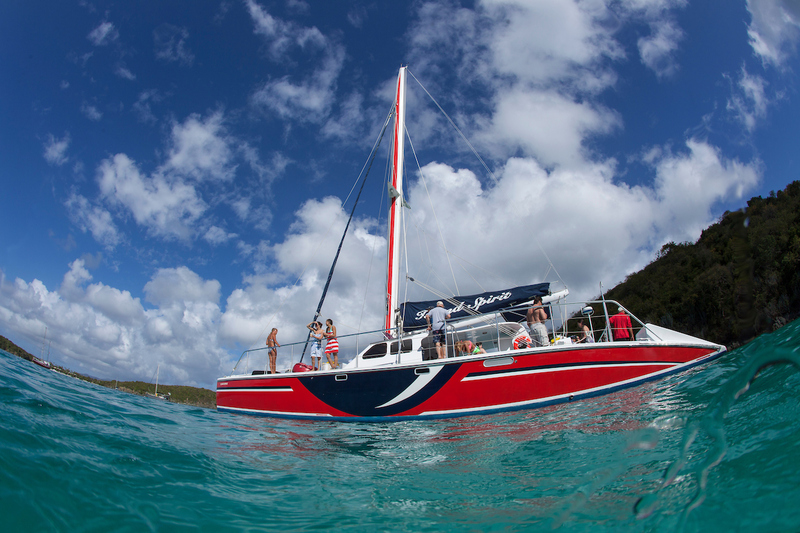 With Cruz Bay Watersports, your entire excursion will be planned out and organized by our team of experienced captains. Most of our trips include some kind of snack or meal, onboard beverages, and whatever gear you might need (as well as someone who knows what they are doing)! A ferry boat will pick you up and drop you off on Jost Van Dyke, but a Cruz Bay boat will stick with you the whole time to guarantee you are having a great time! Cost includes your trip to and from Jost Van Dyke, as well as food, drinks, and snorkel equipment. Experience effortless entry passage through customs. An itinerary of activities is planned throughout the day such as snorkeling and visiting local watering holes. The schedule is set and has little flexibility. Leave it up to the experts, who are trained to keep you safe and make sure you have an awesome time! You might prefer something a little more exclusive for your group, in that case, a private charter would be a perfect option for you! Let Cruz Bay Watersports take you on a private charter to Jost Van Dyke! We will customize the perfect itinerary for your unique charter experience, and fill your day with a unique Caribbean adventure organized by our expert staff. This is the perfect option for someone traveling with a larger group, for a corporate getaway, or for a special event. Whatever the circumstance, we’ve got you covered. Private charters are completely customizable, chat with our special event staff and plan your ideal trip together – it doesn’t get much better than that! *Keep in mind that you are required to have a passport and go through customs to visit Jost Van Dyke, BVI.